Home Basketball Laso ironic about Rudy's injury: "I do not like to pretend that my face has been broken"
Laso ironic about Rudy's injury: "I do not like to pretend that my face has been broken"
The coach of Real Madrid has confirmed that Sergio Llull is doubtful for the Cup and that Trey Thompkins is definitively low. 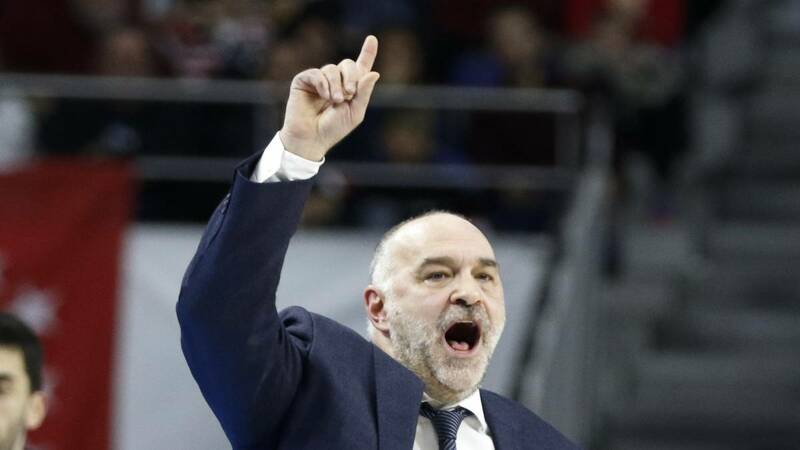 Pablo Laso, trainer of the Real Madrid, was "really happy" s after the league win against Baskonia (82-76) for the game "very serious and complete" of its players, although he acknowledged that they did not have the right nor the percentages of shooting of other days. "Baskonia is a team with many weapons, but we have always had an answer and I am happy with the work and with the victory", explained at a press conference the Vitorian coach, who said he had the feeling that their last two games -the one on Sunday and the one they lost on Friday against CSKA in the Euroleague- have been "very good" . "We have not had the success of other days and neither good percentages -admitted- , but we made very well played shots and we were able to win the last three quarters with a lot of work ". In his opinion, his men were solid and concentrated before the Basque team and managed to complete a good defensive work, limiting the offensive rebound rival, and moved the ball well the attack. "Today the team has worked very well, there has been a magnificent atmosphere in the Palace and now we have to recover quickly because we expect a very attractive Cup weekend, "concluded Laso. In addition, the vitoriano has confirmed that Sergio Llull will be doubt until the last minute for the Copa del Rey, in which Trey Thompkins will be down, while Rudy Fernández is awaiting medical tests after suffering a heavy blow to the face on Sunday, Real Madrid coach Pablo Laso said today after the victory against Baskonia.
" Let's try to get it to Friday . If it were for me, I wish I could play but I can not er neither optimistic nor pessimistic, "responded the coach from Vitoria when asked about the evolution of the Balearic base, who has missed the last few games due to muscular discomfort. What he did confirm is that Trey Thompkins will be definitively down for the Copa and that Rudy Fernandez suffered a heavy blow on Sunday and has been transferred to a hospital to have an MRI because his face and eye are "very swollen" . "We are afraid that he may have something broken because he has swollen very fast the face ", added Laso, who hoped that the player" has nothing serious "and reach point for the Cup, where Real Madrid debut on Friday against Movistar Estudiantes. It is feared that the injury of the Balearic Islands is a fracture in the orbital bone of the eye.